As corn starts to emerge amid cool and wet soil conditions, the potential for nutrient deficiencies is high. Proper diagnosis is the important first step to management. Next is deciding how to manage those deficiencies once they’re started. Here’s a look at four key nutrient deficiencies for the early season and what to do when you spot them. Nitrogen deficiencies cause a yellowing in corn leaves, often displayed in a V pattern starting from the tip of the leaf. Because nitrogen is mobile in the plant, the yellowing will show in the older bottom leaves first. Early in the season, nitrogen is required in very small quantities, so a deficiency may not be noticeable unless the soil concentration of nitrogen is very low. Also, since small plants do not have a fully developed root system the nitrogen may be in the soil but in a position that is not available to the plant. First, double check your soil. 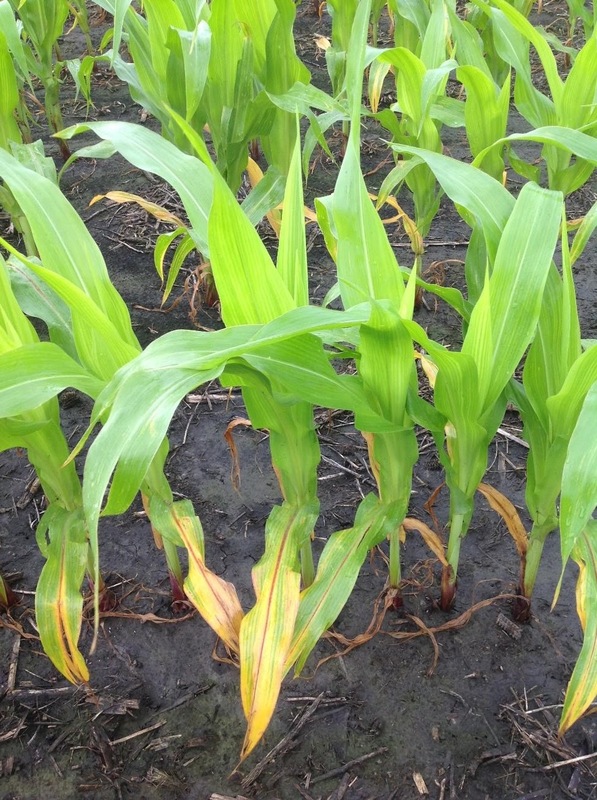 Cool or wet conditions can sometimes induce temporary nutrient deficiency symptoms because the crop is not actively growing. If that isn’t the case, consider a fertilizer with nitrate-nitrogen. Since it is mobile in the soil, an application of nitrate-nitrogen can supply the plant with a readily available nitrogen source. Tools like University of Minnesota Extension’s supplemental N rate decision guide can help to determine if additional N should be applied in June. This close to emergence a wait-and-see approach may be required to determine if the corn crop will recover. Phosphorus deficiencies can be common particularly in early planting when soil is still cool. In corn, phosphorus deficiencies show in the form of purple coloring on the oldest leaves. 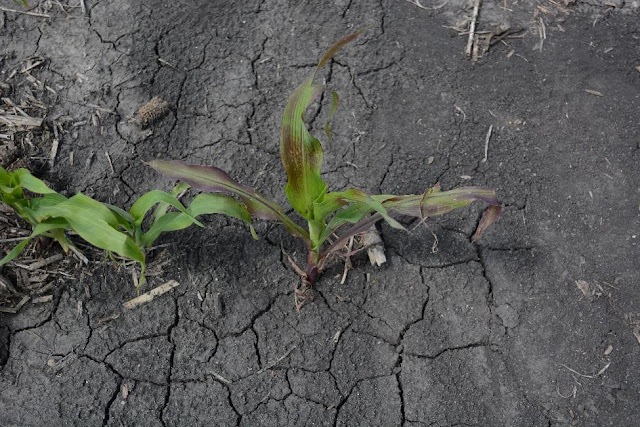 Over time, that purple color will diminish, but the plants may become stunted and fall victim to other nutrient deficiencies due to a poorly developed root system. Because this purpling of leaves is characteristic of grasses, soybeans do not exhibit the purple coloring and are more difficult to visually detect. Since phosphorus is not mobile in the soil, a surface application of P is not suggested to alleviate a deficiency and foliar application of a P fertilizer source has not been shown to consistently increase yield. If the deficiency is due to cool temperatures, plants should grow normally as soils warm. Use a soil sample to confirm if the soil is low in P, and note the area of the field where you drew your samples, as it could be something that needs to be addressed in future years. Sulfur deficiencies are characterized by a yellow striping pattern on the leaves. Because sulfur is immobile in the plant, the striping will show in the newest leaves first. These signs are very similar to those of an iron deficiency, though iron deficiencies are rare in Minnesota corn. When temperatures warm, organic matter will decompose and may start to release more sulfur. As long as that striping disappears by the time the corn reaches the fifth leaf (V5) stage, no fertilizer should be required. Research has shown that if the nutrient availability is indeed insufficient for corn, sulfur can be applied to the V5 growth stage with no expected reduction in yield. Sulfur is mobile in the soil, so a surface application of a sulfate source, like ammonium sulfate or gypsum, followed by rainfall to incorporate the material will get plant available sulfate-sulfur to the root. Elemental sulfur should not be used as the lone source of sulfur in soils prone to a sulfur deficiency or for side-dress application if a deficiency is suspected. Watch fields where elemental sulfur is applied, as plants do not use sulfur in an elemental form. Oxidation of elemental sulfur to plant available sulfate-sulfur is a slow process and may not occur early in the growing season. The sulfur contained in Ammonium thiosulfate liquid is half in the elemental form but has been found to be effective at correcting sulfur deficiencies. Ammonium thiosulfate should be applied directly to the soil and not applied on the crop foliage as damage can occur. Zinc is the only micronutrient of concern for corn production in Minnesota. The uptake of Zinc can be affected by cool and wet soils. 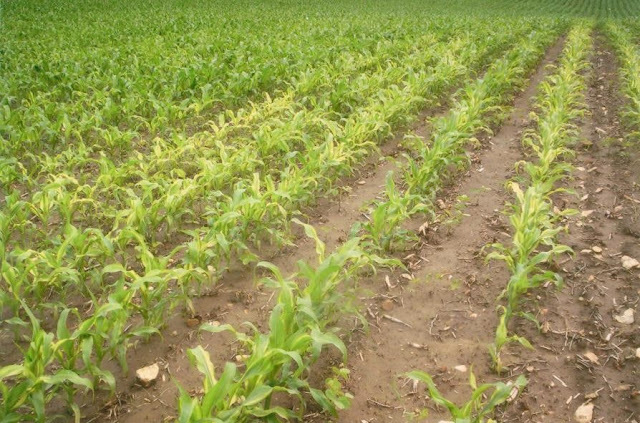 Deficiency symptoms are not common unless soil test Zn is in the deficient range. 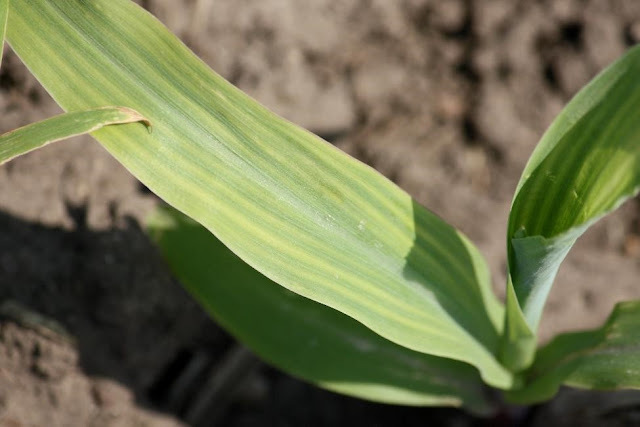 Zinc deficiency symptoms mirror sulfur deficiency symptoms with one major difference: zinc deficient plants will show stripes on the leaves that are whiter in appearance. Those stripes may coalesce and form white bands on the leaves and do not stay between the leaf veins. If you suspect a zinc deficiency, a tissue test or a soil test should be able to determine confirm whether it exists in a particular field. A foliar application of a chelated source of zinc may help alleviate symptoms but may not fully correct the problem is soil test zinc indicates a deficiency. Note the deficient area and apply fertilizer zinc at or before planting in future years. What deficiency symptoms are you seeing this year? Do you have a plan to manage them? Let us know in the comments!